No change in signals after a fairly quiet week of trading; the S&P opened at 2671 and closed at 2665. Zooming out, it looks like prices are at an inflection point. The S&P closed just above the 2018 Q4 downtrend two weeks ago but didn’t make much progress last week. In fact, the S&P appears to have closed below the recent uptrend line; without a real “lower high” closing price, the uptrend was always tentative. So there’s a small chance that the Q4 downtrend isn’t complete. Switching to the near-term, the S&P ($SPX) found support at the 50-day moving average, but couldn’t sustain the pace its uptrend, as mentioned above. And prices still haven’t broken the 2018 Q4 downtrend line. The DI+ / DI- continues to signal a bullish environment. As mentioned last week, we haven’t seen a lower weekly close in some time. I could imagine a scenario where prices meet resistance at the 2018 Q4 downtrend and lose some ground before establishing a real uptrend and moving higher the rest of Q1. 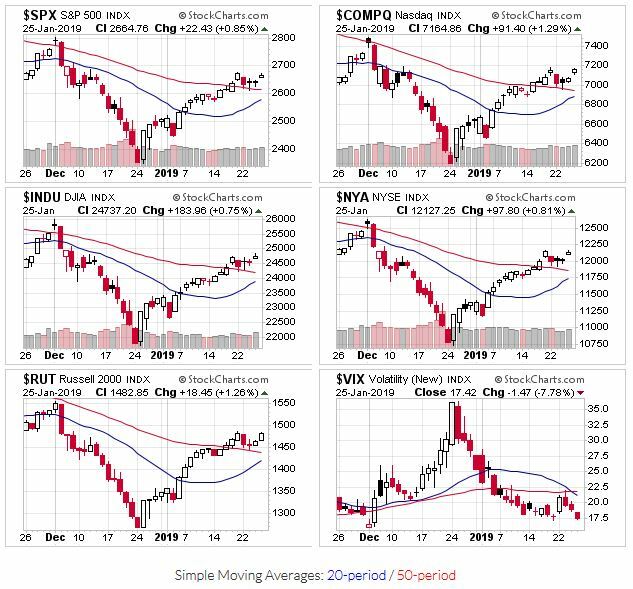 The averages start the week above their 50 day moving averages. 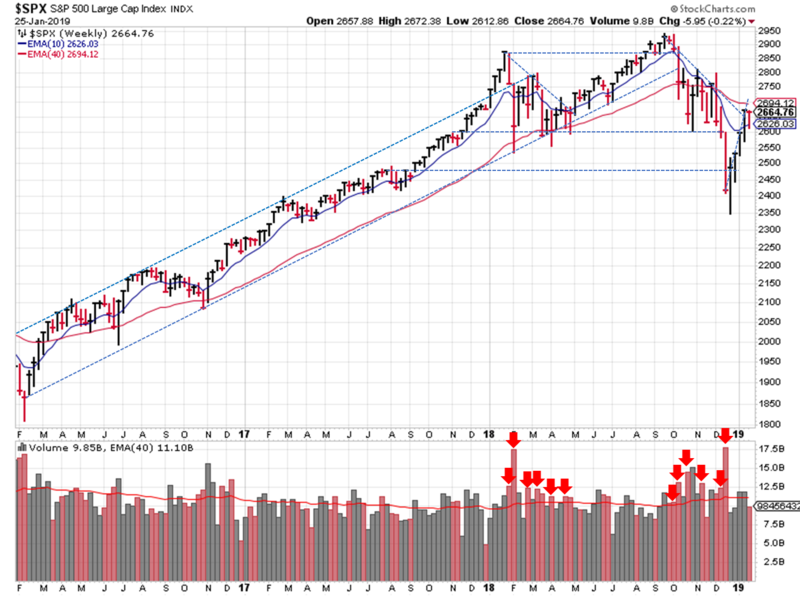 Price and volume also looks positive, as the S&P hasn’t seen a distribution day since early January. And finally, OEW puts the probability of an uptrend at 80% this week, and odds of a bull market at 50%. 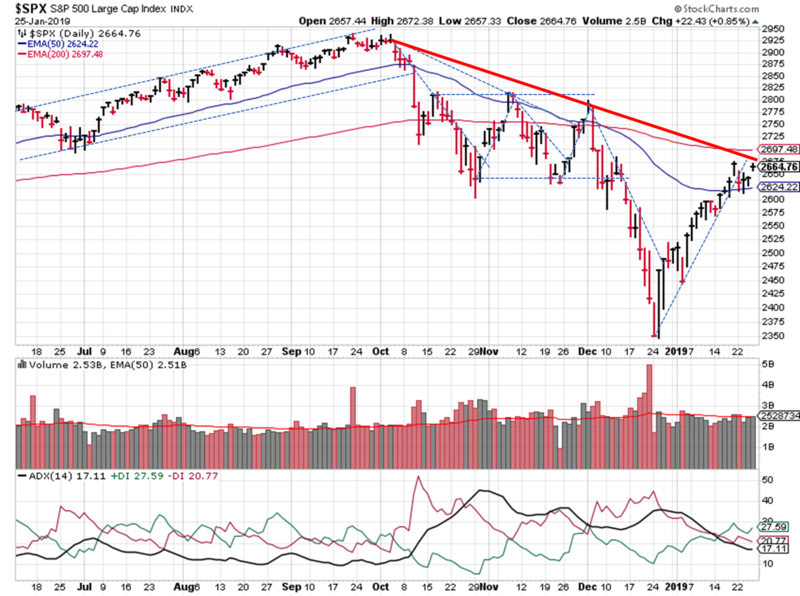 On the plus side, any extension of the Q4 downtrend or signal change is likely a buy the dip opportunity. And no whipsaw last week!